Stuart Graham (left) scored a try against hosts Stirling County for Hawick (archive image). Hawick will be keeping themselves busy over the Six Nations recess and essentially doing what they aim to do on a regular basis. Head coach George Graham is keen for them to keep reaffirming what they do best and iron out the habits which lead to mistakes. Amid regular training sessions, the Robbie Dyes face Stirling County at home on February 16 in the Scottish Cup quarter-final, while they are also due to fit in a Booker Border League final at some point, with the league programme resuming on March 2 at home to Heriot’s. Graham said there were a lot of positives to extract from last Saturday’s game at Bridgehaugh, also against Stirling County. But another defeat for the Greens – 25-12 – was coloured this time by a certain lack of spirit. “We played very well in the first 20 minutes and we stuck to the procedures we had worked on in the set plays,” he said. “We were getting in behind them, getting some ‘two on ones’, and doing really well. “Then we just made one mistake, which ultimately led to a penalty, which then led to another penalty, which led to a try. “Then the boys’ heads went down and we were battling all the time. Graham nevertheless took some encouragement from the display, in which Andrew Mitchell and Stuart Graham scored tries and Lee Armstrong nailed a conversion. “The boys were still working and still playing for the full 80 minutes,” he said. Looking ahead, Graham said it was too deep into the season to start making massive changes, so the Robbie Dyes would focus on what they were doing and try to put a game structure together. Hawick could only influence what they did themselves and could not control the fortunes of other clubs, he said. “If we do what we are doing, that’s all I can ask of the players,” added Graham. 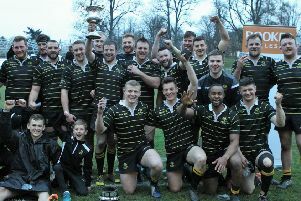 Meanwhile, Hawick secretary John Thorburn confirmed the club will be moving the date of its annual Kings of the Sevens competition, starting in the new season. This term’s event at Mansfield Park will still be going ahead on April 20 – but the Greens leg of the competition for 2019-20 is due to take place on August 10. “It’s definitely happening,” said Thorburn, also the club’s sevens convenor. Even if the winter was relatively mild, teams were still plaing in April and it was a long season for the players, added Thorburn. Peebles moved its sevens contest to August a few seasons ago and the logic seemed to work well, he added. Borders clubs and Kings of the Sevens clubs had been asked and were in support of Hawick’s move, said Thorburn.